Nicolas – the little guy to the left coming at the ball – is 4 years old. The new skill is to run down the field (in this age group they don’t play positions) and get in front of any play and defend the goal! And he’s determined about it! Jessica is in high school – these girls are tough. Play is about an hour and a half…. She is generally playing mids. Ian played in Templeton this week – 8 years old – this is his 3rd year of soccer. He has been mainly playing goal – but some forward too. They are all three good players – smart about the game. Note the cheering section! Amy (their mom) is in the foreground. 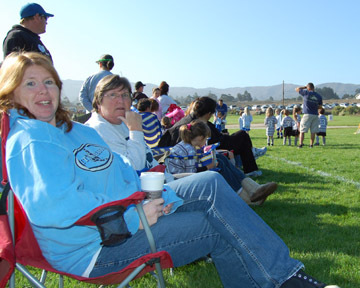 She was at Nic’s game at 9am, Ian’s (an hours drive away ) at 11am and then back to Jessie’s game at 2pm…. Home at 4pm….